Why Do We Dread The Dentist? Studies show you’re not alone. The fear of going to the dentist is estimated to affect 9-15% of the population. Of course, the real danger is that the fear will stop people from going to the dentist early to take care of a condition. As the condition worsens, those people will end up at the dentist—but for emergency services, which might make their fears a reality. It’s a vicious cycle, right? You might think that people who have a definite phobia of going to the dentist would take better care of their teeth so that they won’t need to go. But it’s not that simple. Research shows that the very fear of going to the dentist affects the way people treat their teeth. They are more likely to have worse dental health because the dread is linked to how they feel about their mouth in general. Even if you don’t have a full-blown phobia, though, dental anxiety is not completely unwarranted. It’s not even unusual for most people to feel a twinge of stress when they go to the dentist. (Some studies have concluded that 75% of people have at least some fear about dental visits)! Why is that? What is it about the dentist that makes people feel this way? It’s not just early childhood memories that may be causing your anxiety. 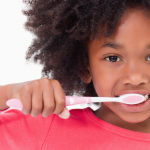 There may be biological reasons why we don’t want dentists in our mouths. Your mouth is a sensitive and vulnerable part of your body. Several basic needs may be threatened through the mouth, including your air supply. Our deeply-ingrained biological survival mechanisms may be at work when the anxiety sets in. Avoidance is a natural response to feeling discomfort or pain. Personalities with a strong need for control tend to feel very helpless as a dental patient. When you’re in the chair, you have no control of the situation. And if you’ve had traumatic experiences (whether with the dentist or not), that may only intensify these feelings. Our experiences with the dentist can further magnify or diminish our fear. If you feel dental anxiety, remember that the most damage it can do is to prevent you from showing up at your dentist’s’ office and thus jeopardize your health. It’s important to talk to your dentist at once about your anxiety. Remember, most people feel this way at least to a certain extent, and it is a natural reaction to having someone poke around in your mouth. So don’t be embarrassed–be direct. Your dentist will then be able to understand up front and strategize ways to make your treatment experience easier. Another tip is to bring along someone who you know and trust, and who does not have similar fears. Family members who feel the same way as you are unlikely to alleviate your anxieties. So be intentional about who you pick! Also, when you’re with the dentist, you can think about things that will help you feel more in control of the situation. For example, if you find that the horizontal angle of the chair is intimidating, ask to have it positioned more vertically. Finally, consider making a special appointment with our Penn doctors. We want all our patients to feel comfortable at our clinic. Our goal is to create an easy transition for you and your family, so that you can have improved dental health and less fear every time you come to the dentist. Fill out this form to be contacted so that you can get dental treatment from our sensitive doctors at Penn Dental Medicine. We want to help you overcome your fear by giving you gentle care that improves your life and health.